And What Makes It So Special? Balsamic vinegar might be the most sublime of all the vinegars. Sweet and smoky, this dark elixir can be used in salad dressings, sauces, and marinades, and even drizzled over steaks or fresh fruit. 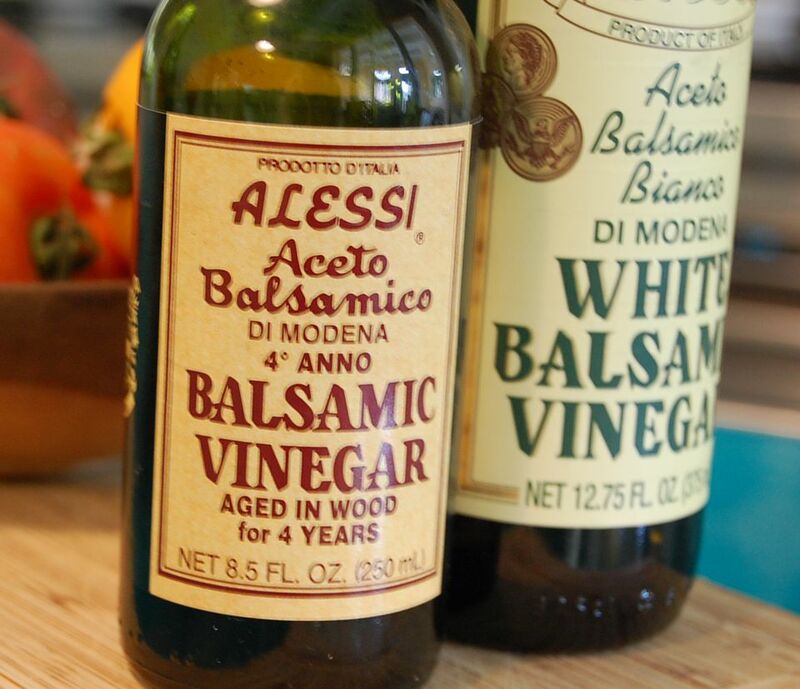 Balsamic vinegar is one of those products about which some purists can get very fussy. Indeed, to qualify as the highest grade of balsamic vinegar, the so-called Aceto Balsamico Tradizionale di Modena or Traditional Balsamic Vinegar of Modena, the product must be made in a specific way, from a certain kind of grape, in a particular region in Italy, aged for specific length of time in a certain type of barrel, and on and on. There's an industry consortium in Italy that bestows a stamp of approval to balsamic vinegars that meet these precise parameters. They even decide what sort of bottle it can be packaged in. How it works is, the grapes are pressed, and the resulting juice is cooked, during which time the sugars in it darken through the process of caramelization. That's what gives the final balsamic its dark color. This syrupy reduction, called a "must," is then fermented and aged in a series of wooden barrels, sometimes for up to 25 years, slowly building the deep, complex flavors of the final balsamic vinegar. Which is all well and good, but even a tiny bottle of Tradizionale balsamic vinegar can cost hundreds of dollars. And you won't see it on the shelves at the grocery store anyway (although you can find it online). Moreover, these traditional balsamics are not really what you would think of "vinegar." Because the aging process brings out so much sweetness, they're more syrup than vinegar. That means they aren't really acidic enough on their own to make a very good salad dressing (but they'd be wonderful in a marinade). Traditional balsamic vinegar can be used in tiny amounts as a condiment with cooked or cured meats, grilled fish, drizzled over fresh fruits and berries and even ice cream or other custard desserts — or even just sipped from tiny shot glasses at the end of a meal. Most if not all of the balsamic vinegars that are commonly available are commercial grade products that don't meet one or all of the above criteria. That doesn't mean they aren't good. They're just a completely different product. Fortunately, the official consortium has seen fit to create a separate designation for these commercial grade balsamic vinegars. They call it Balsamic Vinegar of Modena. Look for a bottle that says its been aged for at least four years in wood barrels, and you'll be all right. While they are not strictly traditional, there are all kinds of flavored variations on balsamic vinegar, including ones that are infused with raspberry, cherry, fig, lemon, pear or even honey. There's also a white balsamic vinegar, or Aceto Balsamico Bianco, in which the grape does not undergo a caramelization process, and is then aged in stainless steel barrels rather than wood. This white balsamic is actually a rich golden color. It's a good choice when you don't want a dark-colored dressing to overwhelm your salad's appearance. You can concentrate and intensify the flavor and aroma of a good quality balsamic vinegar by making a balsamic vinegar reduction or glaze. Just pour a bottle of balsamic vinegar into a saucepan, bring it to a boil and then simmer until it has reduced by about three-quarters. It should be a thick, syrupy glaze. A few drops of balsamic reduction can be used to flavor risotto, grilled fish and seafood, even cheesecake. What is Beef Chuck, and What Is it Good For?